So this was Rounds 3 and 4 of the Welsh Sports and Saloon Car Championship. The race meeting was with the Aston Martin Owners Club at Oulton Park in Cheshire, about a 3 hour trek for me. Not fun on a Friday afternoon, but taking the back route via Worcester was a pleasant drive. My wife was coming along to help. I had not driven Oulton Park since doing a trackday there in 2012 and to make matters worse, the championship had a meeting there last year. I know I was going to up against it for this one. I tried to learn the track the best I could by watching the Driver 61 track guide (it’s a great website) and numerous Caterham races to understand the lines/overtaking/defending places. I was a little apprehensive when I woke up to overnight rain meaning the roads were wet. Last time I was at Oulton Park in the wet, I very nearly had a ‘big one’ exiting Druids and going backwards towards the Armco at silly speeds…. Thankfully it was just about dry for quali and dry for both races. Quali was only 15 minutes so I had to tighten the belts and really go for it. I managed a 1.59.8 which I was pleased with. It put me 5th overall (a small grid for this meeting for some reason of only 14 cars) and most importantly 1st in class, but only just. Looks like it was going to be a battle again! No bother as I like to ‘race’. After quali I decided to measure the petrol I had used. I was carrying way too much fuel for the whole of the last meeting - its excess weight and all in the wrong place out the back of the car. I parked the car high on the trailer and used my trusty garden hose cut off to syphon the fuel out. It worked a treat in my garage….this time I choked on super unleaded and then spent the rest of the morning burping petrol (really – was degusting and reuned lunch which was all petrol tasting). Whilst the smell of petrol is actually quite nice in my opinion, I can say that the taste is, err…an acquired one and blooming strong. Still, 6 litres used minus a mouthful. The first race was a long wait and the start was a total mess-up. The invitation racer on pole set off way too quickly (after the safety car peeled in,) and then slammed on his brakes when as lights took a way too long to go out. This bunched up the whole pack and I was off the throttle when the lights did eventually go out (doing an emergency stop!). I held position, but my main class competitor drove past almost all of the main group at the front and it ended up with him in front of me and one car between us. I tried to go around the outside of one of the slick shod cars into Old Hall at the start and quickly regretted it as I was right on the limit of spinning. An big armful of ‘oppo’ just about keeping me facing the right way. Pure luck rather than skill really. I then spent the next 2 laps trying to get past the car in front (a Cupra touring car thingy) until he got past my class competitor and drove off. I was now right behind my class competitor - race on! As we did for the last 2 races, it was ‘hammer and tong’ for a long time with little between us. A few laps from the end I managed to get past, again, round the outside of the hairpin (Shell Oils). I then drove it home nervously for the class win. I was well happy with that and punched the air as I took the checkered flag. I must have looked like a right numpty. After the race, I spoke with the championship organiser who told me that whilst it was another great battle, it was academic. My competitor was due to be served a 10 second penalty for jumping the start. This never materialised as I eventually finished ahead of him. Race 2 was late in the day – 6.05pm in fact and much later then I would have liked. It’s just too easy to mentally switch off. The winner from Race 1 choose not to race (not sure why) and one of the other cars ahead of me was a double drive (so they go to the back of the grid). One other car, the father of my main class competitor decided to ‘have some fun’ and go to the back of the grid. I was not convinced and said to my wife when we were in the holding area ready to go out ‘I hope he doesn’t get in-between me and his son’….. Still with the attrition at the front I was promoted to second on the grid. My first front row start which was a little weird. The start this time round was much better. 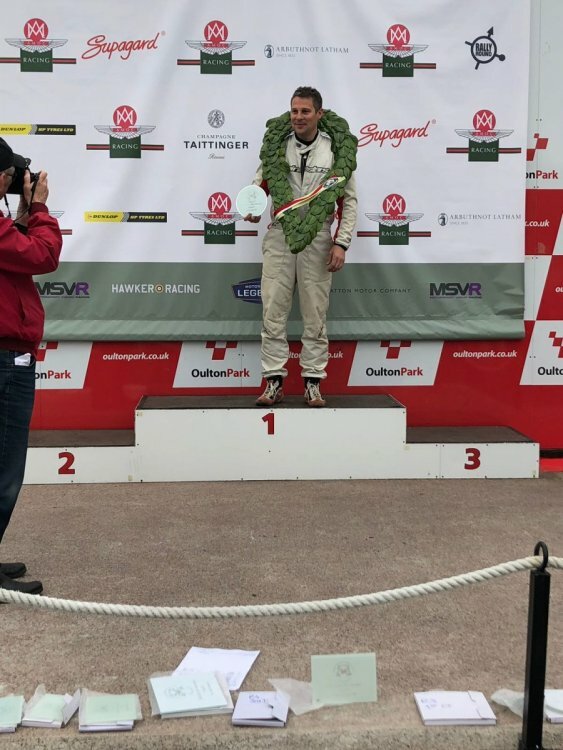 I kept first place honest for at least one corner….. until he took off like the proverbial scolded cat (he was in another Cupra touring car thingy). I was side-by-side with my main competitor into Cascades and it was all very tight for the first few corners. He eventually got ahead until I out braked him on the following lap into Cascades, it was properly close stuff. We followed each other for a bit until I got outbreaked into Druids, a great by move by him to be honest and one I was not expecting! By the end of the second lap, his dad had joined the party. Great. He overtook me down the straight then ‘parked’ his car for nearly 4 of the 8 laps between me and his son (see the TSL timing extract below which is very telling - fastest three laps after he cleared off!). I used my frustration for motivation and tried to get the most out of the car. Taking risks, when his dad had finally cleared off, I nearly got past on more then one occasion, but it was not to be. I also managed to just touch him on the breaks going into the Shell Oils hairpin. I now need to repair my nose cone (I ordered blue Duck Tap specially on EBay this morning! 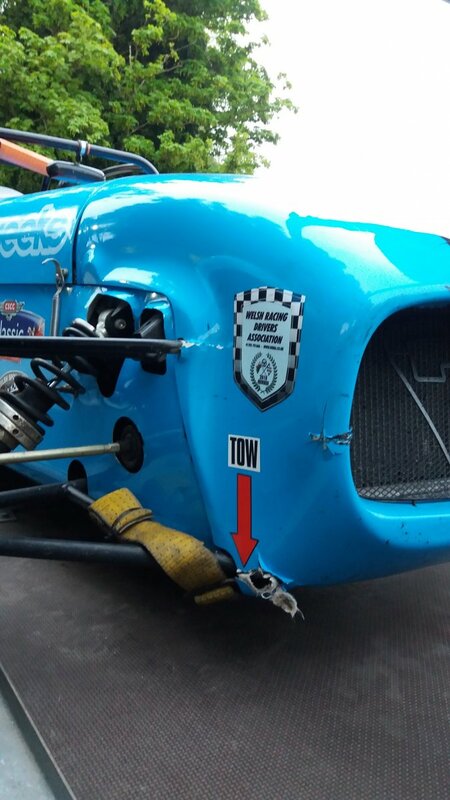 )….that’s two bodywork repairs in two races…..woops (although the fist was not my fault). Speaking with his father after the race, I made the point that he got in the way. His response - 'I had a gearbox issue'. Quite a coincidence that! Even more annoying was I don’t have any video. The SD cards were both saying full when they were empty. Meh. So it was a bittersweet end to the day. I had fastest class lap in both races and a first and a second in class. I really should have been happy but felt a little cheated as I know I had the pace. 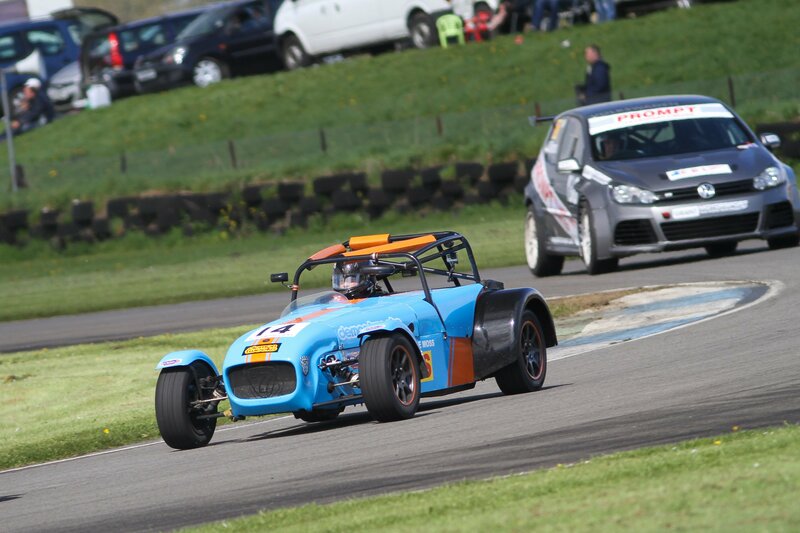 Nevermind, there’s always Pembrey on the 10th of June and now I’m really keen to win my class again as I know it will put me in a good place for the Championship. Thanks - I'm well chuffed. Incidentally, I have just bought a decat pipe as well as booked a remap so I hope to be a little quicker next time out (cant see it will make much difference but why not)! Also just found out that I'm now leading the championship! Happy days...it won't last.